Albacon is returning to the Best Western Albany Airport Inn on Wolf Rd. in Albany, NY. This hotel is very convenient to I-87 Exit 4, the Albany International Airport, and a number of other Public Transit stations / stops. They are also one of the few hotels on Wolf Rd. with a traffic light to make getting in and out of the parking lot much easier and parking is free. Note that some of the above locations are only available to Albacon Members. The hotel is two stories and does not have an elevator! If you need a room on the first floor, mention that when you make your reservation! Be warned that the hotel will not guarantee a first floor assignment, but we can. After you make your reservation, submit a Hotel Special Request via the form on the Reservations page. If you need a handicap accessible room, please submit a Hotel Special Request Form located at the bottom of the Hotel Reservations page. Our reservation block closes on Friday, March 10, 2017; three weeks prior to Albacon 2017. 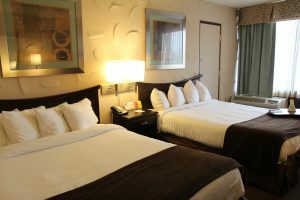 See the Hotel Reservations page for information on how to reserve a room and get the room type and location you need. Smoking is only permitted in designated areas on the property. Please ask a staff member for information about smoking locations. If you are planning on hosting a party at Albacon 2017, and we encourage you to, you must register your party in advance with our party coordinator. All of the party rooms will be located adjacent to each other with direct access to the Pool Room. Parties that are not registered with our party coordinator will be shut down. Please take a look at the Parties Page for more information on hosting parties and to register your party. The hotel is pet friendly, but charges $20 per pet per night if you bring your pet along. If you are paying for your hotel room with a debit card, the hotel will place an authorization hold on your card (account) for an amount equal to one night’s stay (including tax). When you check out, they will charge the full amount of the stay to your card (account) and release the hold. It may take a few days for your financial institution to release the held funds, so do not panic if it looks like you were charged an extra night. If you still see an extra charge a week after you check out, please call the hotel and explain the situation. They will confirm that they released the authorization hold. At that point you would have to take the situation up with your bank.